Anh (Joseph) Cao was born on March 13, 1967, in Saigon (now Ho Chi Minh City), Vietnam. Cao was the fifth of eight children. His father served as an officer in the South Vietnamese Army and was later imprisoned by North Vietnamese officials during the Vietnam War. At age eight, Cao immigrated to the United States with two siblings, older sister Thanh and younger brother Khanh. During the Fall of Saigon in 1975, as North Vietnamese troops overran South Vietnam’s capital, Cao’s mother took the three children to a nearby airfield and, while she remained behind, spirited them onto a military transport with their aunt. The younger brother lived in Guam with the aunt; the sister went to Florida to live with a foster family; and Anh lived for the first several years in the United States with an uncle in Goshen, Indiana, before they relocated to Texas. Cao learned English from his elementary school classmates in Goshen.3 He graduated from Jersey Village High School in Jersey Village, Texas, in the northwestern suburbs of Houston. He earned a bachelor of science degree in physics from Baylor University in Waco, Texas, in 1990. During his outreach to the poor, Cao had an experience that altered his path to the priesthood. “In life’s journey, you sometimes reach a level of uncertainty that you have to make such a leap,” he once explained. “I was working in extremely poor conditions, and I wanted to promote social change. I came to believe, over the course of two or three years, that the best way to do that would be to enter public office. It would also allow me to have a family—the celibate life can be quite lonely. So I drafted a course of action for myself to enter politics. But it was a quite painful discernment. It implied I would have to leave the seminary. I would have to start life over again. I would have to make that leap of faith.”5 In 1996 he left the Jesuits and, while reestablishing himself, lived with his sister Thanh in Northern Virginia. A year later, Cao returned to Loyola and earned his law degree in 2000. He worked as an immigration lawyer and personal injury lawyer. While studying law, he met a pharmacy student, Hieu (Kate) Hoang, who had once been one of his catechism students at the local Catholic church. They married in 2001 and later had two daughters, Sophia and Betsy. Cao’s first run for political office was inspired when, in early 2006, the city announced plans to place a waste landfill in their community. Cao led the opposition and provided legal advice to fight the move. At one meeting between city residents and federal officials, Congressman Mike Honda of California, head of the Congressional Asian Pacific American Caucus, urged the Vietnamese community in New Orleans to become more politically active.7 In 2007 Cao heeded that call. The city scrapped its plan for the landfill because of the protests. That success propelled Cao to run for a seat in the Louisiana state house of representatives. With no organized support, he ran as an independent and finished fifth in a six-candidate field. The Times-Picayune later described it as an “inauspicious” political start.8 But Cao’s effort won the notice of Bryan Wagner, a Republican and former city councilman in the 1980s—reportedly, the first to be elected to the council since Reconstruction. He persuaded Cao, a lifelong independent, to join the Republican Party. In 2008 Cao challenged nine-term, Democrat incumbent William Jefferson. Jefferson, an Ivy League-trained lawyer, had been a force in local politics for two decades and was immensely popular with the city’s majority black population in no small measure because he was the first African American ever to represent the city and the first since Reconstruction to represent Louisiana in Congress.9 His district took in almost all of the city of New Orleans, including the French Quarter, sweeping out far to the east to encompass the less populous portions of Orleans Parish. It also swung across the Mississippi River to take in several West Bank towns and then west through Jefferson Parish and into portions of the towns of Metairie and Kenner, the largely white suburbs west of the city. The total population of the heavily Democratic district was 60 percent African American. Meanwhile, Cao ran a quiet campaign and won the Republican primary unopposed. His under-the-radar approach was strategic, he later recalled, meant to lull Democrats into a false sense of security. “We sat there and waited, we didn’t do any hoopla,” Cao noted. “We stayed low profile.”12 His areas of local focus were coastal restoration, levee protection, and redevelopment of New Orleans after Katrina. Education and health care policy were two other areas of interest for Cao. After Jefferson won his primary, Cao’s campaign went into high gear. “We started sprinting,” Cao recalled, buying advertising time to highlight Cao’s character and honesty and stressing the need for open government. Cao won the backing of several high-profile politicians and received a helping hand from Mother Nature. When Hurricane Gustav forced the postponement of the Louisiana primary elections in early September, it set the entire process back a month. This separated the 2nd District election from the presidential election in early November, where the African-American Democratic candidate, Barack Obama, won by large margins on his way to his historic election as President, a trend which likely would have helped Jefferson in the House race. 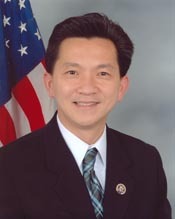 Shortly after the opening of the 111th Congress (2009–2011), Cao won assignments to three committees that had direct bearing on his port city district: Homeland Security; Transportation and Infrastructure; and Oversight and Government Reform. Yet, despite the GOP’s promotion of his historic election and his strong set of committee assignments, Cao was an uncertain ally for party leaders from the start. They may have claimed him as their future, but he soon proved to be a difficult vote, sometimes flirting with and at other times joining Democrats on some of the 111th Congress’s landmark legislation. In the wake of the 2008 recession, the first major bill considered by the Democratic-controlled Congress and backed vigorously by the White House was an economic stimulus bill widely seen as the public-focused companion to the large lifeline (Troubled Asset Relief Program) that Congress threw to the big financial institutions in the fall of 2008. Believing they had been cut out of the drafting process, House Republicans, led by GOP Whip Eric Cantor of Virginia, declared that no Republican would vote for the bill. Philosophically, Cao also seemed to diverge from his party on one of the defining political issues of the decade. Whereas Republicans uniformly rejected a major health care reform law backed by Democrats, Cao believed such legislation was necessary and would benefit his constituents. “I listened to the countless stories of Orleans and Jefferson parish citizens whose health care costs are exploding—if they are able to obtain health care at all,” Cao explained. “Louisianans need real options for primary care, for mental health care, and for expanded health care for seniors and children.”21 Years of tending to the poor and participating in the post-Katrina recovery in New Orleans informed that viewpoint, but Cao’s vigorous anti-abortion position also shaped his vision of health care reform. The caveat was that he would never support a bill which allowed federal money to be used to conduct abortions. Nevertheless, the House passed the Affordable Care Act and President Obama signed it into law in March 2010. The net effect of Cao’s waffling was to enrage at one point or another both conservatives and progressives in his district. On other hot-button social issues, Cao was far out of step with social conservatives. He cosponsored and voted for the Hate Crimes Prevention Act of 2009 (Matthew Shepard and James Byrd Law) that provided federal and local law enforcement with more resources to investigate and prevent hate crimes and stiffened federal criminal penalties for individuals convicted of carrying out hate crimes. He also supported legislation to repeal the U.S. military’s “don’t ask, don’t tell” policy that prevented gay men and women from serving openly. In an historic election that yielded Republicans a gain of 65 seats, sweeping them back into the House majority, Cao was one of the few GOP losses on the national map. Richmond prevailed handily, winning 65 percent of the vote to Cao’s 33 percent.31 Cao gave no farewell address in the House Chamber, nor were any made by colleagues on his behalf. After he left the House in January 2011, Cao returned to New Orleans, where he currently practices law. In 2016 he ran as an unsuccessful Republican candidate for a U.S. Senate seat from Louisiana. 1Adam Nossiter, “History and Amazement in House Race Outcome,” 8 December 2008, New York Times: A18. 2Amanda Ruggeri, “Republican Cao’s Unlikely Journey from Seminary to Congress,” 4 March 2009, U.S. News and World Report, https://www.usnews.com/news/articles/2009/03/04/republican-joseph-caos-unlikely-journey-from-seminary-to-congress (accessed 6 April 2011). 3Neely Tucker, “The Possible Dream: Louisiana’s Historic New Congressman Seems to Surprise Everybody but Himself,” 30 December 2008, Washington Post: C1; Nossiter, “History and Amazement in House Race Outcome.” See also Gerard Shields, “Difficult Early Life Forged Cao’s Character,” 18 January 2009, Advocate (Baton Rouge, LA): A12. 4“History,” on Anh (Joseph) Cao’s campaign website, accessed 5 November 2008, http://www.voteforanhcao.com/mission.html (site discontinued). 6Ruggeri, “Republican Cao’s Unlikely Journey from Seminary to Congress.” See also Ylan Q. Mui, “After the Storm, Mr. Cao Goes to Washington,” 14 December 2008, Washington Post: B2. 8Michelle Krupa, “Anh ‘Joseph’ Cao Beats Rep. William Jefferson in 2nd Congressional District,” 6 December 2008, New Orleans Times-Picayune: n.p. 9See Office of the Historian, U.S. House of Representatives, “Black-American Representatives and Senators by State and Territory, 1870–Present,” http://history.house.gov/Exhibitions-and-Publications/BAIC/Historical-Data/Black-American-Representatives-and-Senators-by-State-and-Territory/. For more on Louisiana’s only other black representative until Jefferson’s election in 1990, see Office of the Historian, U.S. House of Representatives, “Charles Edmund Nash,” Black Americans in Congress, http://history.house.gov/People/Detail/18846. 10Almanac of American Politics, 2010 (Washington, DC: CQ Press, Inc., 2009): 660. 11Almanac of American Politics, 2010: 660. 13Almanac of American Politics, 2010: 660. 14Office of the Clerk, U.S. House of Representatives, “Election Statistics, 1920 to Present,” http://history.house.gov/Institution/Election-Statistics/Election-Statistics/. 16Rick Jervis, “Vietnamese Hail Cao’s Win over Jefferson in La.,” 8 December 2008, USA Today: n.p. 17John McCardle, “Cao Pegged as Short-Timer Following Historic Win,” 9 December 2008, Roll Call: n.p. 18Paul Kane, “GOP Finds an Unlikely New Hero in Louisiana,” 9 December 2008, Washington Post: A1; Josh Kraushaar and Andy Barr, “Boehner: The Future of GOP Is Cao,” 9 December 2008, Politico, http://www.politico.com/story/2008/12/boehner-future-of-gop-is-cao-016336 (accessed 9 December 2008). 20Bob Woodward, The Price of Politics (New York: Simon and Schuster, 2012): 16–18, 21. 21“Health Care’s LONE Republican Supporter Is Rep. Anh ‘Joseph’ Cao,” 8 November 2009, Huffington Post, http://www.huffingtonpost.com/2009/11/08/joseph-cao-health-cares-l_n_349779.html (accessed 24 February 2011). 22John McCardle, “Frankly Speaking, Cao’s Candor Not Always Good,” 6 August 2009, Roll Call: n.p. 24Congressional Record, House, 111th Cong., 2nd sess. (16 March 2010): H1471. 25Congressional Record, House, 111th Cong., 2nd sess. (20 March 2010): H1749. 26“Joseph Cao Tells BP Exec: In Samurai Days, You’d Kill Yourself,” 15 June 2010, CBS News, http://www.cbsnews.com/news/joseph-cao-tells-bp-exec-in-samurai-days-youd-kill-yourself/ (accessed 24 February 2011). 27Mike Honda and Anh “Joseph” Cao, “BP Oil Spill’s Impacts on Vulnerable Minority Communities,” 9 August 2010, The Hill: n.p. See also Mireya Navarro, “Spill Takes a Heavy Toll on Gulf Workers’ Psyches,” 17 June 2010, New York Times: A19; and Cao’s interview, “Oil Spill Impacts Vietnamese-American Workers,” 17 May 2010, National Public Radio, http://www.npr.org/templates/transcript/transcript.php?storyId=126883721 (accessed 8 July 2015). 28See H. Amdt. 702 to H.R. 5297, 111th Cong. (2010). 29John McCardle, “Richmond Makes Bid Against Cao Official,” 9 September 2009, Roll Call: n.p. 30David Gibson, “Louisiana’s Anh ‘Joseph’ Cao, First Vietnamese-American in Congress, a Rare GOP Loss,” 3 November 2010, Politics Daily: n.p. "Anh (Joseph) Cao" in Asian and Pacific Islander Americans in Congress, 1900-2017. Prepared under the direction of the Committee on House Administration by the Office of the Historian and the Office of the Clerk, U.S. House of Representatives. Washington: Government Publishing Office, 2018.